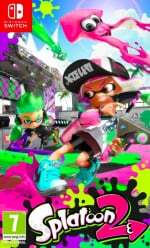 If you're a keen Splatoon 2 player, you probably found yourself getting involved in the weekend's Splatfest activities, joining up with fellow teammates around the world to reign supreme on the world's most colourful battlefield. The results from the event are now in, and it was Team Treat who grabbed the win this time around. This special Splatfest was a worldwide event, seeing players from across the globe picking from the two very same teams - Team Trick and Team Treat. You can probably guess that this was a Halloween-themed spooktacular, and there were all sorts of amazing costumes and decorations on display to make things extra special. Team Treat pulled it out of the bag and scored a sweet 'n' spooky Splatoween victory over the weekend! As is often the case, the losing team actually managed to secure the most player votes, but Team Treat managed to squeeze wins in both the Normal and Pro categories. 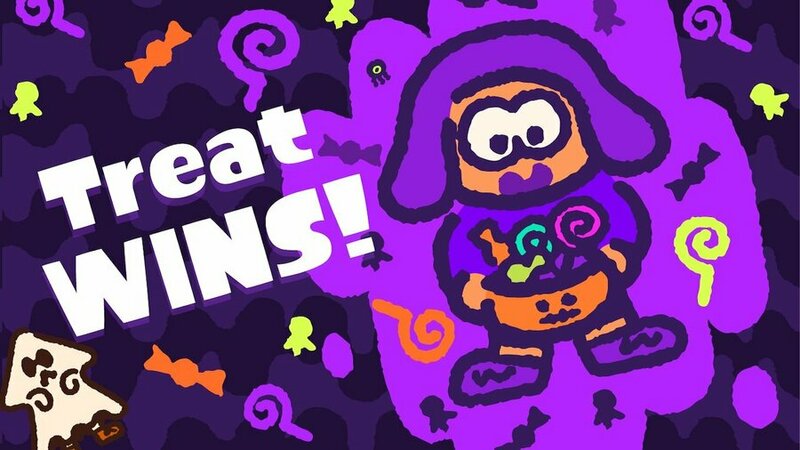 Did you take part in this spooky Splatfest? Did you enjoy all of the extra decorations and festivities? Let us know with a comment. Would have been great if I wasn't getting forever-long queue times, repeated disconnects, and crashes whenever my partner tried to join me. Glad my team won, would've been absolutely furious otherwise. 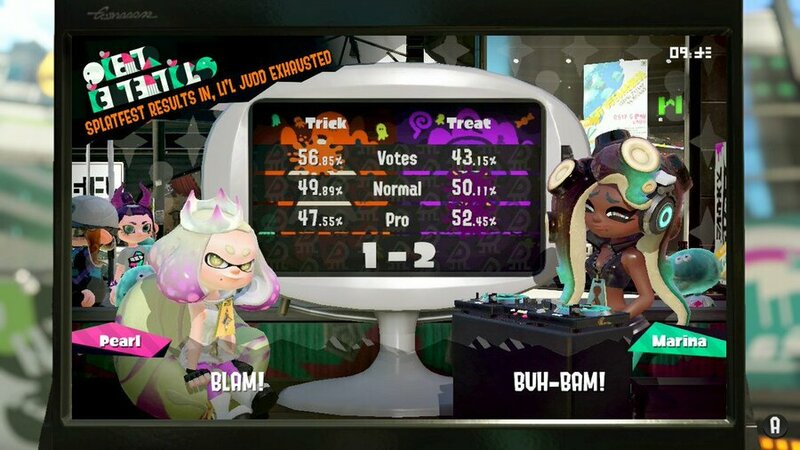 This splatfest was, as clearly advertised (Halloween theme) a bloody freaking nightmare. I think I won about 15% of my games, and I ended as Treat Queen. All in all it was an absolutely dreadful experience. Didn't help matchmaking popped me vs teams with overall 200+ more mmr than my teams. I appreciate the victory though, however little I contributed to it. @Blizzia A victory that COULD NOT HAVE BEEN LEGITIMATE as Team Treat was HORRIBLE. Not sure why I can't make myself to play Splatoon 2 (and MK8 Dx) anymore even just Splatfest considering Splatoon on the Wii U is one of my most played games along side MK8 and XCX. @PigmaskFan It was legitimate, but I agree, Team Treat was absolutely horrendous. I can’t believe I won a Splatfest, lol! Good game everyone! I had a break of a few months from Splatoon 2, really enjoyed going back in for this Splatfest. I barely experienced connection issues personally. Best moment was beating a team that had a 24 win streak. I didn’t have any problems. Being able to join your mates was at last possible and made for a better experience. That's the only way Marina can win a Splatfest, these days. If it is a worldwide event. Because lord knows she can't win a NA event to save her life. @Blizzia I was experiencing people on team Treat dropping out in the first 24 hours, but less to none of that during the 2nd half. (Maybe the bad players forgot it was a 48-hour event, lol). I'm curious about the people who experience teammates dropping out, having squid parties, otherwise being a nuisance, etc. What were your average Splatfest power levels? I've been as low as 1400 (last year, not now, whew! people have gotten better in general) and as high as 2200 and I noticed that battles tend to be more 'normal' (players sticking it out even if they're losing, no shenanigans, etc.) the higher up your team's Splatfest power is. Is it like that for everyone else? I’m shocked that this was the outcome, I only lost a handful of times, and won the majority of my games for Team Trick. To top it all off, the match making was utter garbage during this Splatfest, several times I literally waited in the lobby for a solid 2 minutes. Nintendo Switch Online was a mistake. DANNNNG! I forgot all about it! I was practicing for about two weeks trying to get back into the game just for this event. Oh well. I had fun jumping back in and I'll probably continue to play. @masterLEON Well let me tell you this: It was a bloody rollercoaster and there was no team spirit or sticking it out in sight, for me. I started out winning the first 7 games in a row in pro mode, giving me my usual high splatpower (before the diving started I sat around 2100-2300s), and I ended around 1700 after around a 100 games during the 48 hour splatfest. I dipped as low as 1630 or so. There was no real difference between 1 hour after start and anytime before the end, people were doing squidparties, afking, "feeding" (I mean cmon, I'm in the field vs 4 enemy players, the entire bloody map is clearly full of yellow ink, representing the enemy team, and my 3 teammates decide it's a good idea to super jump to me) or dropping out. It's the worst Splatfest I've ever had. My usual Splatfests have me playing around 40 games with ~60-90% winrate (depending on luck with teammates), but this was mental. I myself did notice a lot of weird grouping with teams. Actually this was the first Splatfest I’ve played in Splatoon 2 where I noticed a higher rate of playing with the same players in back to back rounds. This was both good and bad. What really caught my attention was how bad the Salmon Run teams were- I’m talking loosing 10+ in a row as at a “professional” level. I don’t know if there’s been a large influx of new players recently since I’ve taken a short break from the game or what but it was jarring. @Deku-Scrub Nintendo Switch Online isn’t the real problem here. I’ve noticed whenever there’s a worldwide Splatfest it gets a bit bogged down at times. Actually I though it was better this time around honestly- I had maybe 3 disconnects when I used to have a lot more. @Mamabear Yup... I'm pretty sure we had an influx of newer players, or old players refusing to pay for online... Because I really was paired up with lvl 5-20 people quite a lot. @Blizzia Agreed on all counts. Matchmaking was taking the longest it ever has for me, and kept matching my team against much more skilled opponents. Every match was a blowout, even the one match I won was a blowout. Surprised by the result. I played a lot of the Splatfest and managed to earn Trick Champion. The first day it felt like we won 90% of our matche and the 2nd day around 60%. Matchmaking for me was great, the best it's ever been for a Splatfest. Both team mates and opponents were found in surprisingly quick times. I'm mostly being matched with players from Japan though so that certainly helps. @Blizzia Ouch, I guess it's just luck of the draw then. Almost sounds as bad as my TMNT Raph/Leo experience. Or worse, Chicken/Egg (my teams in bold). Hope the next one goes better. This was my first Spletfest as I just recently bought the game, and boy did I like it! I also ended up in the winning team so I’m even happier! Enjoyed the longer two day splatfest. Most of my disconnects were with friends. Had a very hard time playing with friends on teams many, many disconnects. Sad. Solo was better. Made some new friends along the way - fun! Whats the difference between "Normal" and "Pro" modes? Most of the people I played with on Pro were new players. I'm honestly glad to hear I wasn't the only one in Team Treat who had a rough time, and was surprised by the outcome. Friday night and Saturday night, I was losing 5 out of 6 rounds consistently. I played a bit on Sunday morning and had MUCH better luck. Maybe it was the home stretch that put us over the winning mark. I went 18-13 for Team Trick, and had some truly dominant games in there along the way. I ended with over 54000 clout and stopped as soon as I hit Trick King. I did my part for my team and it was a good Splatfest! Love the extra theme decorations and costumes that really made this feel like a Halloween celebration! I regret not looking at the timings and booting up just after it finished. If it’s Halloween themed is there another round next weekend? @JediKadabra Yup, was dreadful this time around. I've never experienced anything like it tbh. @masterLEON Haha, yeah! Nice clip btw. Personally I was really frustrated with losing, but my kda ratio was still really good. Usually went through games having inked the most on my team, splatted the enemy 7-20 times, and died a time or two. All in all it worked out well. @JoeDiddley No, this was it. Would have been neat if they scheduled it closer to Halloween, though. Had some issues Saturday night. Got disconnected once, connection unstable errors a few times, and several times the enemy team only had 1 person. Was on team trick because of Orange paint. Never lost so many matches before in regular. The good players were all in pro it seems. Treat had a few JPN teams just destroying us. Honestly? As a Trick member I wasn't expecting a win. 1. Kids play this game and kids love candy. 2. Marina was the Treat leader and some people would call her one. But I still went with Trick because I dislike candy and wanted to pick honestly. It's all just for fun. GG everyone! I was on team Trick and have to echo what has been said here. Most teammates where complete garbage. They wouldn't paint the turf back at our starting point a lot of the time. It was thr worst bull I have ever seen in Splatoon. @Peterjr1 @Deku-Scrub hmm I’m curious as to your guys locations. I’m in Florida, NA. Played a good 10 hrs over the 48 hr splatfest and I had a really good experience with maybe 3-4 disconnects and My queue times were fairly short. Thinking since it's P2P maybe certain locales are being problematic. Issues with 4v3 most games. Long-ish lobby waiting time. If im honest these problems have always been there NOS has not made it worse, its still a poor online service but now I'm paying for it. I did like the 2 day format, it should be implemented for all splatfests. @Peterjr1 Try fully powering off your Switch. Hold the power button until it completely powers off(not sleep mode). This fixed constant wifi issues that my wife had and was given that guidance from customer support. It worked immediately. @Peterjr1 @Grogan again these are issues I’m not having. Maybe a dedicated server might fix your issues since it’s p2p you may be having people with bad connections. Also I’m hardwired whenever I’m playing online which maybe why I don’t have the issues. I had an absolute blast with this one! Several great games that were very close! The most fun I have had with a Splatfest in a while! As a team treat king, I'm genuinely shocked we won. My teammates were absolute garbage 100% of the time. I didn't have a single team that made me want to continue playing with them. I ended up 15-17 overall, whereas I usually win 80% or more of my matches. I'm S+ in everything but Clam Blitz (S), but I can't take on an entire team by myself. Also, this Shifty Station had the worst design of all time. I'm also hard wired and always have been. I don't suffer many disconnects myself its others making it 3v4 and playing shorthanded in Splatoon makes it pointless. If it were the odd game in ten it wouldn't be so bad but sometimes it's every other game. Spoils an otherwise excellent game.